Film reviews, discussions, peppered with personal taste. This movie is incredibly like Drive. 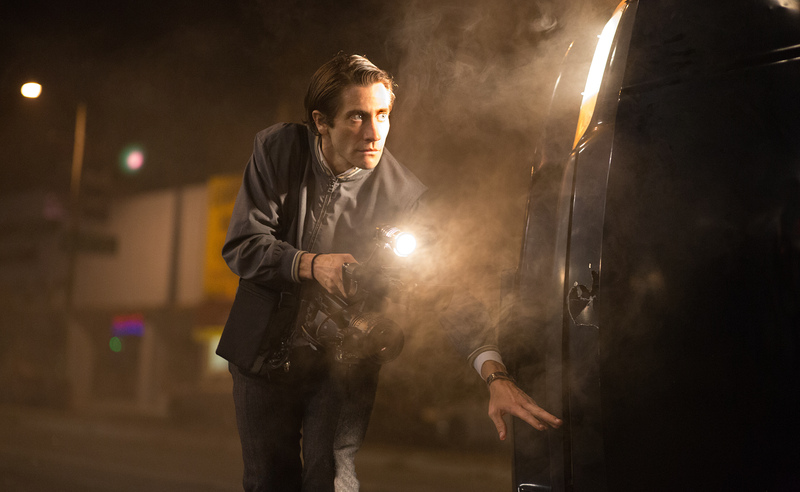 If you liked the tone of Drive, then undoubtedly, you will love the tone of Nightcrawler as well. 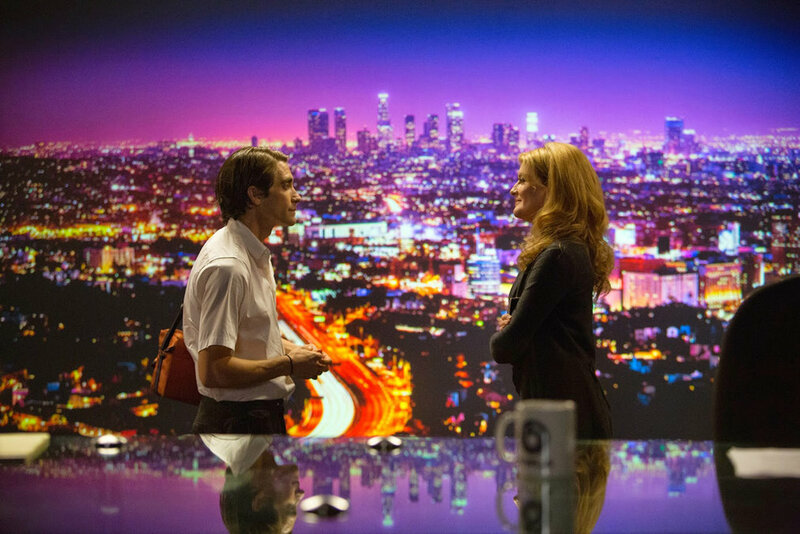 However, the aftermath of Nightcrawler left me feeling a lot more unsettled than other movies. It’s hard to explain exactly what I mean without including spoilers, but I will try my best for now. 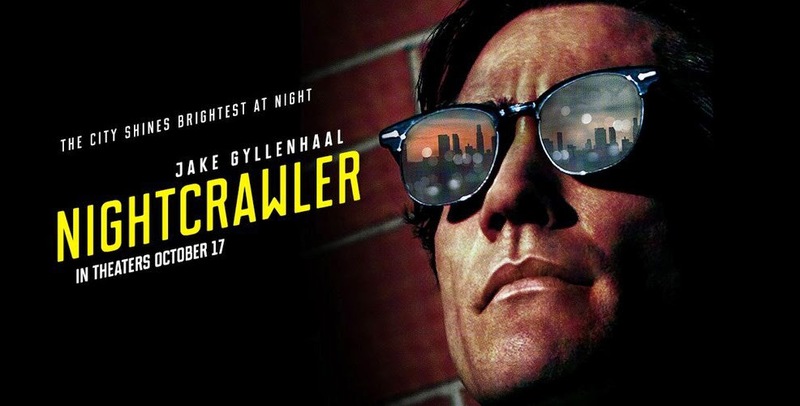 I think the main selling point of this movie for me was the main character, Louis/Lou Bloom, portrayed by the fantastic Jake Gyllenhaal. For me, Gyllenhaal has always been a fairly underrated actor. It’s not that he is completely unknown, but I feel like he has been somewhat overshadowed over the years by others in the industry and his undeniable talent in the craft of acting has been ‘ignored’ almost. His performance in this however has definitely got to be one of my favourites, YET. I think the character is complex. With very little exposition on the characters background, we are thrown into his life, where he steals metal parts from around the city to sell to scrap heaps which I can only assume is to get some money to make ends meet. Yet, throughout the rest of the movie, we see a very self-motivated, self-educated man who manages to bring his own small business to life, literally letting nothing get in his way. With him being titled as a thief from the beginning of the movie, I think my expectations of the character were set pretty low from then on. But once you see his incredibly ability to manipulate others to bend to his will, I realised that Lou is in fact a very intelligent individual that will stop at no means to get what he wants. It’s like what Nina, Lou’s contact inside the news world and somewhat love interest, says; I think Lou inspires all of us to aim higher (to paraphrase). Despite the character being somewhat a little unhinged, I would be inclined to agree with this, which is unsettling to say the least. 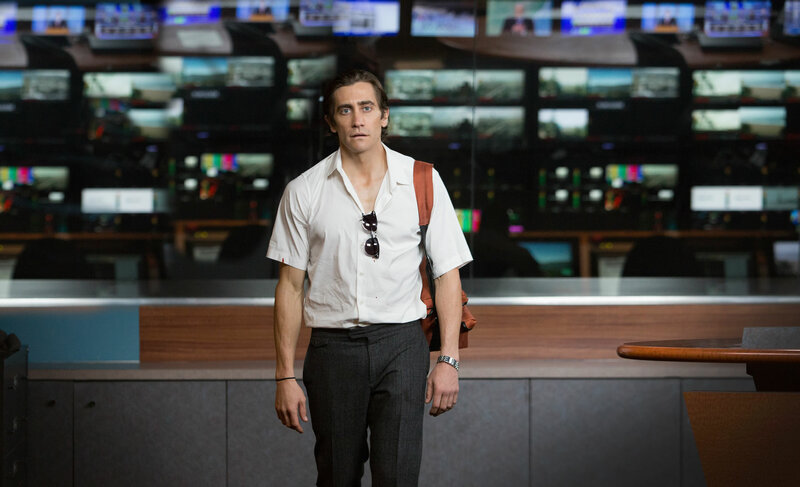 But really, Jake Gyllenhaal’s performance is incredible. I read a fact earlier today on the IMDB page for the film that stated that his character is on screen for 166mins, and Lou blinks a grand total of four times. This gives a slight idea as to how intense the character is – its almost like he literally can’t take his eye off of the prize. Gyllenhaal said himself that his character reminds him of a hungry coyote and I agree with him completely, especially if you take into account that he lost 20 pounds for the role. For someone who didn’t really understand that nightcrawling was a thing, I think the portrayal of the character was perfect in working towards exposing the gritty side of the media. It was a nice surprise to see Riz Ahmed in the supporting role of Richard/Rick, who accompanies Lou on his nightcrawling adventures, and sometimes challenges his somewhat morbid antics. It felt to me that next to Nina, portrayed by Rene Russo, and whom served almost as the driving force behind Lou’s antics, Rick provided the voice of reason. And its not often that you would consider a homeless man a voice of reason. The cinematography for this movie was absolutely stunning. Like I said, I actually prefer the world at night, so its perhaps a personal preference. But the fact that almost the entire movie is set at night or in the early hours of the movie, it really helps to set the tone and make this movie complete by creating this unspoken world that is swept under the carpet. When shooting at night, I imagine that one has to be extremely resourceful with the light used, so as not to make the shot look grainy and horrible, but at the same time, making the lighting look natural, and I think the movie hit that balance perfectly. I just really, really loved the look of this film and I wish that I could live within that world the whole time. The actual story itself, I found extremely compelling. We follow one man’s journey to success; just the ways that he go about it are…unconventional. Lou Bloom is just such an interesting character that I felt like I just wanted to know more about him. I’m not sure whether you could say that his character was a sucker of the American Dream but I could definitely see that being an interpretation of the movie, as his morals go completely out of the window for him to be able to achieve his goals. There’s hardly a moment in the film where Lou doesn’t spurt something that doesn’t sound directly quoted from an online learning course, or a self improvement book, and when it isn’t, its something with extremely dark undertones the reveal much darker truths to Lou’s character. For a while, I’ve been looking for a film that successfully plunges it’s audience into the middle of the a person’s life, shows a slice of their life, and doesn’t plague the audience with unnecessary amounts of exposition. It just isn’t necessary. If the dialogue is well crafted and the characterisation of the characters are done well, then the audience can formulate their own world around the character, and make their own judgments about them. I don’t believe that this kind of information should always be spoon fed to the audience; you want to keep your audience guessing, not insult their integrity and imaginations! So, to conclude. This movie, for me, has everything that I look for in it. I thoroughly enjoyed the movie, have already been to seen it twice and am longing to see it again, just because I want to immerse myself into the world and into the character’s life that much. I would strongly recommend to fans of Drive, and any fans of Jake Gyllenhaal’s will enjoy yet another fantastic performance that I hope lands him at least a nomination of some sort. Favourite Part: Lou working on his framing by uh…altering the crime scene. Or him investigating the home invasion in Grenada hills. Comment your favourite part! I’m intrigued.